Lady Wave Emma Klosterman sets a new school record in the triple jump. GREENVILLE- Lady Wave junior Emma Klosterman now holds the school record in the triple jump. Klosterman jumped 33’3.75″ Monday night breaking the previous school record of 32’7.75″. Klosterman has broken two school records in just two years. In 2018 Emma broke the school record in long jump several times and currently holds the school record with a jump of 17’3.5″. The Lady Wave finished second with 42 points while scoring in 13 of the evening’s 17 events. The Troy Lady Trojans took first place with a total 0f 107 points. The Butler Lady Aviators rounded out the top three with 15 points. Franklin Monroe’s Selene Weaver took first place in the girls pole vault with a jump of 11’0” to give the Lady Jets a total of 5 points on the night. The Green Wave boys earned first place with a total of 116 points scoring in each of the 17 events giving the Greenville boys a first place finish for their third consecutive meet. Troy took second place with 36 points with Butler taking third place with 16 points. Greenville travels to Troy Friday, April 5 to compete in the Troy Invitational with a 4:30 p.m. start time. 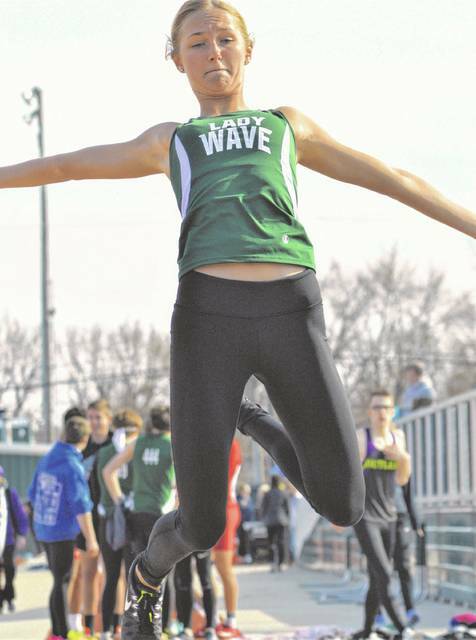 https://www.dailyadvocate.com/wp-content/uploads/sites/34/2019/04/web1_Emma-Klosterman.jpgLady Wave Emma Klosterman sets a new school record in the triple jump.